You can learn to be a dog trainer. A career in Dog Training can be very rewarding, both for you, for the dogs you train and for the owners. 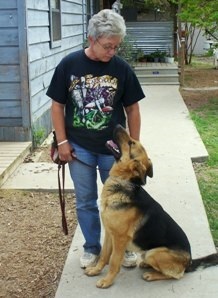 Dogs that are surrendered to shelters typically have no training, no manners, and are difficult to live with. Training dogs makes it possible for them to be compatible with their humans, resulting in the increased likelihood that the dog will remain with the family for it's entire life. 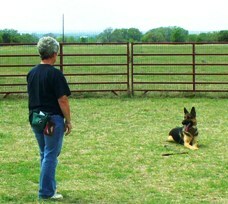 As dogs become more important in our society, the demand for good dog trainers increases. Our training programs offer a good foundation that will allow you to extend your expertise into many aspect of dog training. 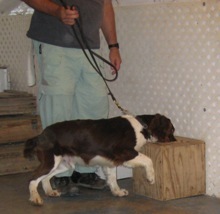 These include obedience, competition, detection, tracking, searching, and assistance. Students in our Dog Trainer programs learn not only how to train dogs, but how to get started with their own Dog Training business as well. Upon completion of the course, a student will have the tools to begin their own business. Southern Star Ranch K9 Training Center has been training for over a decade for law enforcement, private businesses and the general public. We are licensed by the Texas Commission on Private Security as well as the D.E.A. Southern Star Ranch is located northwest of Austin near Florence, Texas. Our training site is situated on 100 acres with spacious areas for tracking, detection and obedience.